Keerai Kootu is a traditional recipe of Tamil Brahmin. You can use any type of greens. The Kootu which I posted before is also different from this. Wash and chop spinach into small pieces. Cook Moong Dal in pressure cooker for 3 to 4 whistles with water. Cook spinach in a vessel with salt and turmeric. Grind Grated coconut, jeera and chilli to a fine paste. Once spinach is well cooked(You will know by the colour) add grounded mixture and dal. Add salt if required. Mix well and until it boils. If its too thick add little water while boiling. Can also add 1/2 tspn of coconut oil. Now season with above ingredients in a hot pan and add to the Keerai Kootu. 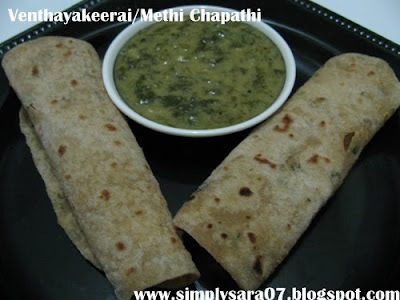 This is a good sidedish for Chapathis or also with plain rice. This recipe is going off to Healing Foods Spinach by Divya event started by Siri. I use green chillies with coconut , but urs is different. Will try out next time. keerai kootu looks delightful with the rotis; I use green chillies usually, yours sound equally good. Very healthy and my family loves this dish!! !